What is the Definition of Flattering Fashion? Often on my blog, I receive comments that one look is more flattering than another, that my look may be more flattering if I lowered the hem, raised the hem, chose a different color, wore a different shoe. And all these comments are usually right for what many consider flattering, but they aren’t always right for me personally. As a blogger I often get caught up with trying to create the most flattering look for the blog to garner the most compliments and the most sales. You’re not going to click on a link and shop if you think I look like a hot mess, and you’re likely not going to stick around as a reader for long if I don’t have inspiring outfits. But often the most flattering looks don’t flatter my soul. My soul is a lot like my home. My soul is a bit disorganized, very colorful, with weird quirky things that catch your attention. A mix of thrifted, inherited, and Freecycled items along with classic pieces bought to stand the test of time. There may be a few scuffs on the furniture and dust bunnies in the corner, but it’s comfortable and there’s often a gathering of friends happening on weekends with lots of music and laughter. I think my wardrobe follows suit. It may not be textbook flattering or stylish or fashionable but it’s very me. And it flatters my disorganized, colorful, real soul. I used to be very judgmental of other women’s outfits. Oh my GOSH I can’t believe that woman would wear that dress! Ew, I would totally put a pair of Spanx on if I were she. I wish I could give that woman some fashion advice, why would ANYONE buy that blouse? But the thing is, we’re all individuals with different priorities, different personal tastes, different lives. Maybe that woman would like some free fashion advice, or maybe that woman is dressing for her soul instead of my armchair quarterback critical gaze. When I realized that, I stopped dressing for strangers and started dressing again for myself. You know yourself better than anyone else on this planet. While a personal stylist, celebrity fashion consultant, or fashion advice blog can provide some very helpful guidelines for shopping and creating personal style, only you truly know what is best for you. If you work directly with a stylist, she would get to know who you are and factor in your personal style. If you’re doing it on your own with advice from a book, show, or blog, you need to be your constant reminder to keep the you in your wardrobe. As for me, I need to also take that advice and continue to dress for me, not the blog. And by doing that there may be some outfits readers may consider fashion fails, but they likely feel like wins for my soul. 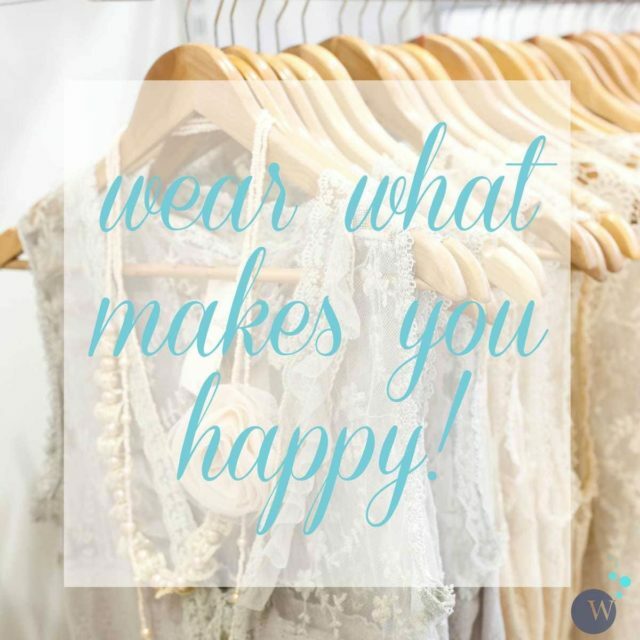 Wear what makes you happy. Wear what makes you feel good. For some, that may be a dress that whittles their waist and makes their legs a mile long. For others it may be more about print or color. And for others, it may be that blouse that stresses out the sartorial part of your brain but makes her soul sing! I don’t know how to define “flattering” in words, but I can certainly tell at a glance what is & is not flattering for myself. I know V-necks work better on me than round. Straight-leg jeans better than boot cut or (worse!) any kind of flare. Primary colours — black, white, scarlet, peacock blue — work, while pastels or neutrals look like hell on me. A lot of this comes from experience & age, but a lot comes from self-confidence: knowing what you feel looks good on you, what you like, what makes you feel gorgeous & sassy & full of beans & ignoring trends & other people’s advice. You have to listen to your Inner You, and only her. I grew up with all sorts of stupid “rules”: never put pink with red, never mix prints, beige is a real colour, jewelry should be understated [I’ver never been “understated” in my life! ], never wear black after age 50, no white after Labour Day. I’ve broken them all. Too many women are afraid being “wrong”, of making a mistake, of being judged. The only mistake any of us can make is to not be ourselves. When we dress to satisfy who we truly are, we’re full of life, energy, laughter, zest & enthusiasm — and there’s nothing more beautiful! And PS: I agree whole-heartedly with Nihongo Dame Desu — it’s all in the fit. I find it interesting that when talking about flattering, people focus a lot on how it flatters the person’s body, but people often seem to forget about color. Whether clothes fit your body is important, but the right color for your skin tone and hair also is very important. It doesn’t look like the personal shoppers featured in that post even took this into consideration. I know that neutrals are in style and it seems like a lot of fashion blogs keep showing these neutrals – light greys, beige, white, light blue, etc. However, I would venture to say that for a good portion of adult women, these colors are not flattering in the least. Sure, if you are young, blond, and tan, these colors look good. But if you are over 30, pale, and have dark hair, like myself, then they just make you look washed out. I see so many women at work who wear these neutrals and frankly just look awful even if the clothes do fit their bodies properly. I am drawn to the neutrals like other people, especially as I get older (maybe because they are simpler? ), but I restrain myself from buying neutral tops because I know they won’t make me look good. Instead, I have been incorporating them into my home decor – a new throw for the couch, a new comforter. You are the exception because you wear color, but I wish more fashion bloggers would focus on clothes that real women can wear and not try to sell readers a dream look that isn’t right for them. I always read your blog, but have never posted before — yet I can’t get this post off my mind — you’ve hit the nail on the head! WHY fashion advice rarely works for me, why stylists and colorists and personal shoppers and image consultants were dead ends for me… I did not know how to name it, but you have perfectly! My soul does not match my body. In my heart I am a small, energetic, dark woman who sparkles and bounces in french chic and japanese simplicity. In my body, I am a tall, curvy, brown eyed blonde, midwestern farmer’s daughter type, pale pale pale Irish/Welsh lass who moves powerfully/athletically and looks best in bulky horse&hound wear or glamorous diva looks. Yuck to both for ME. Look good or feel good. When I feel good, I don’t look great. When I look great, I don’t feel like me. We all weren’t born into the body and face we have the personality and taste for. This is why I honestly prefer shopping for clothes by myself. It’s so annoying when you’re feeling really great about something and then you step out of the dressing room to show your friend and they give you the stinky-face, crinkled-nose look. Such a let-down. I’d rather live in ignorance and feel like I’m rocking it. I think it is about finding the items that are your style/personality and that represent you. No one dresses to highlight the features that make them feel uncomfortable, physically and mentally. I think that for a stylist to try to suggest flattering outfits without some sense of what the author liked was certain to be hit or miss (mostly miss). To me the winning formula is to wear what you love, what suits your lifestyle, and what makes you feel confident. I have always been a firm believer to wear what makes you feel best. I have never been one to wear clothes that show my figure (or lack of it) and even if it look amazing on me, I could not pull it off because I am not comfortable with it. Interesting. I can relate to this. While “flattering” is a top priority for me, it doesn’t always win out over what I think is true to myself. I prefer skirts and dresses, and in particular, knee-length straight or pencil skirts. When I look in the mirror, I think this look is flattering. I don’t feel this way in pants. However, every time I wear a pair of jeans or trousers, I have a handful of friends who fall all over themselves to tell me how long my legs look in pants, and how I should wear them more often. The couple of times I have worked with personal shoppers, they also pushed jeans and trousers on me. But I don’t love them. I stick to my skirts 95% of the time. I like the maxi dresses on her. But that’s probably because I will always be a hippie at heart. I think she looks good in just about anything sleeveless. She has nice arms and my opinion is that she should show them off. I thought she looked nice in most outfits, some of them needed some tailoring, a tuck at the arms, possibly some adjustment of hems. I’d say the personal shoppers did a good job of not trying to squeeze her into things that were too small. The Nordstrom fatigue jacket was my least favorite. It does make me think that where you shop makes a difference. Nordstrom tried to get her into their fatigue jacket style, other places went Eileen Fisher-ish, Mod-cloth had their girly style. As you say, a lot depends on your personal style and what you like. LOVE this.. and it’s true.. I think that confidence and swagger can make an outfit more than the flatter! Though honestly, I don’t know all the rules, but everything you have shown I *get* why you would show it! And it’s make me re-think some of my own issues with clothes. I found a shirt I loved the fit and flatter and it was a more pricey “t-shirt”. But when it went on sale.. I bought a few more. Boom! Done. I am really learning from your posts to “avoid anything I don’t love – RIGHT NOW”. Not if that 5lbs would come off, or if this or that. Right now.. Love it, or just leave it.. and we don’t need a lot.. just the right things.. My little closet might end up looking empty, but I will be happy with anything I pull out.. at least that’s my goal that I am slowly working towards… thank you! Interesting article on BuzzFeed. Too often, people equate “flattering” with “makes you look thinner” or “creates an hourglass shape”. But those aren’t the only ways clothing can flatter a figure, and some figures can never be made to look like an hourglass. It’s true what you write, that flattering one’s figure and flattering (or reflecting) one’s soul or personality can be very different things. If you get really lucky, you can do both with the same outfit. In the past few years, I’ve been drifting away from outfits that only flatter my figure and don’t scream something about my personality or likes. Sometimes I ignore the figure flattery altogether or create a different silhouette than an hourglass with my outfits, which can be just as appealing; it’s very freeing. Wear what makes you feel good, strong, bad-a$$, fun, flirty–whatever. Figure-flattery is not the most important thing, ever. Huzzah! I agree, wear what makes you FEEL fabulous. I think a good fit is far more important than figure flattery. Her favorite outfit would have been something I advised a dear friend against, not because of what it does or does not do to her shape, but because the buttons pull across her chest. I think a woman can look pulled together and gorgeous in an outfit that may not make her look small in the places we traditionally want to be small (or tall or curvy or whatever). But that outfit needs to fit well.